A Tuesday night re-tick this to the GBG entry that’s located on the right side of the station for the football ground. 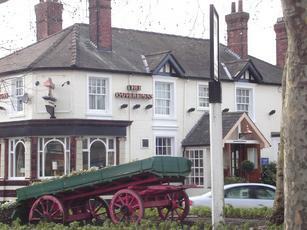 Large pub with various rooms and a good food menu….though I have never eaten here it just looks and smells good. 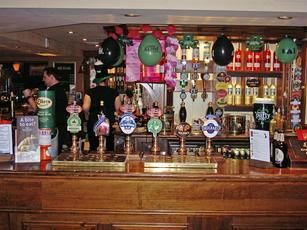 On the bar are 8 hand pumps with a good selection of 8 ales. The several pints of Hadrian Border’s Tyneside Blonde @ 3.9% were very good, and they tasted even better knowing I had used my Camra card for a 10% discount! On a warm September evening I took my pints and sat in the well kept beer garden to the side of the pub. I like the Sovereigns, on both of my visits the ale choice has been good and the ale well kept, quick attentive service and a good location if going to a match at Woking FC. 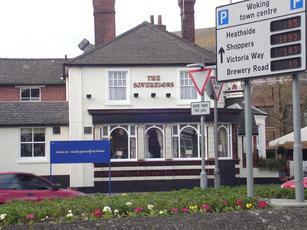 2nd pub of the day and it’s just a short walk to Sovereigns which is the other side of the station from the ‘Spoons. This is an Embers Inn bar as previously mentioned and very nice it is too. Large corner plot on a one way system, benches outside with plants and small trees up to the door welcome you as you enter. 6 ales across the pumps with a very good choice, I went for Long Man Brewery Old Man @ 4.3% a cracking but strong pint even though its only 4.3% abv. Nicely decorated pub that was busy but bizarrely as it wasn’t a cold day the heating was on full pelt. Food was being served and looked good, I checked the menu and the prices were very reasonable. Ember Inn pubs do have a corporate feel but as a chain they are pubs that I like and this one was no exception. Looks like a proper pub from the outside and then turns into a corporate one on the inside. Why do they insist on wall to wall carpet. Anyway the beer was fine and all were priced at £3.19. Had the Golden Pippin and Broadside, and both were very nice. Food while being the corporate menu (and why for that reason is the vegy and gluton free choice so poor) was actually really good, bbq chicken and chips. Outside area, nicely covered was great for this rather hot late September evening. Only downside was the slow service, due to lack of staff rather than them not bothering. With so many customers ordering food at just after 6.00pm extra hands would be an advantage. Mind you Luton Town FC were playing tonight and so a dozen plus of us were in, so the extra crowd may have caused the problem. Far better than the average pub in Woking. Looking unpromising outside on the old Guildford Road, this place is actually huge. Loads of different rooms/corners to sit in, plus outside drinking at both the front and the rear. Eight real ales and a comprehensive (Ember Inns) menu. As it's only 5-10 minutes' walk from the station, this is an excellent alternative to the town centre (which is on the other side of the railway line) especially on busy evenings. Just been voted Wokings pub of the year in a local newspaper competiton. Always has 6 real ale on offer with some from Scotland and Wales. If you are in Woking it is worth going to.